Patent attorneys are representatives in intellectual property (IP) matters. They fulfill various tasks: Performing patent searches, drafting patent applications, representing the client during the application process, conducting and coordinating the internationalization of the patent family or enforcing the rights of granted patents. Since the representative has to be declared before the offices (in case such representative has been appointed) and they are entered on the applications, it is possible to track their activities regarding patent cases they have represented in the application process by analyzing publicly available data sources. The most extensive data set to track worldwide activity of patent attorneys is being provided by the WIPO (World Intellectual Property Organization). Herein, all patent applications are listed that have taken the so-called international route through a PCT application to a potential patent grant. A PCT application is reasonable generally only when a comprehensive level of protection of the invention in the major countries of the world is being pursued. Thus, the database contains records of important patents applied for since 1978. It includes in total 2.3 million patent publications. To ensure that only patent attorneys or law firms are analyzed which have taken significant activities in the international application process, only designated representatives were considered who represented at least 5 PCT applications. This leaves 2.05 million records. In the documents, the representative is not necessarily an individual person. It is possible that just a firm is specified. This makes the analysis very complex because initially all individuals must be assigned to their respective law firms. At the same time, the analysis incorporates a certain error rate which cannot be resolved, because the individual who drafted/represented a patent cannot be traced backed if only a law firm has been specified. Over the entire period from 1978 to 2015 26,815 patent attorneys and 5,185 patent law firms can be identified. Those are distributed across 82 countries. In 2015, 12,371 patent attorneys and 3,243 offices in 66 countries were active. This dataset constitutes the basis of the following studies. How many patents have been represented per country? How many patents have been represented per capita? 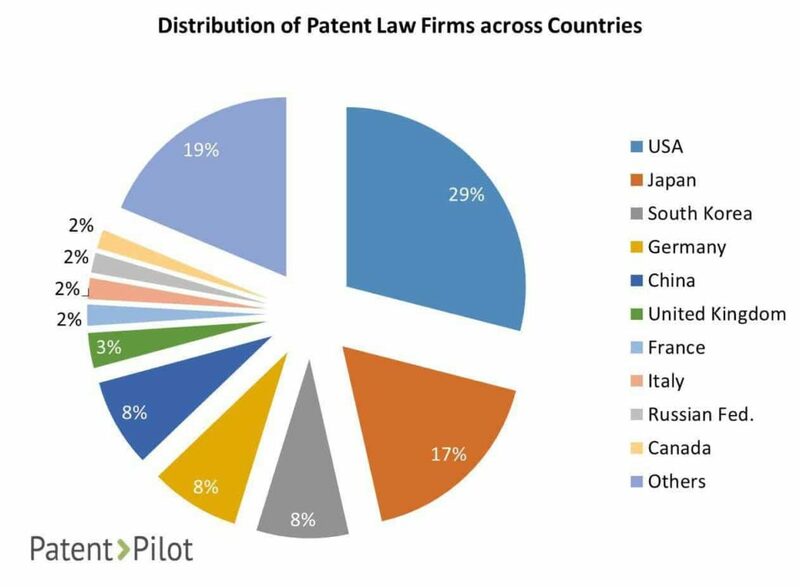 How are the patent law firms distributed across countries? How many patent law firms are located in each country per capita? How many patents does a law firm represent on average per year? How many law firms among the Top 1000 are located in each country? 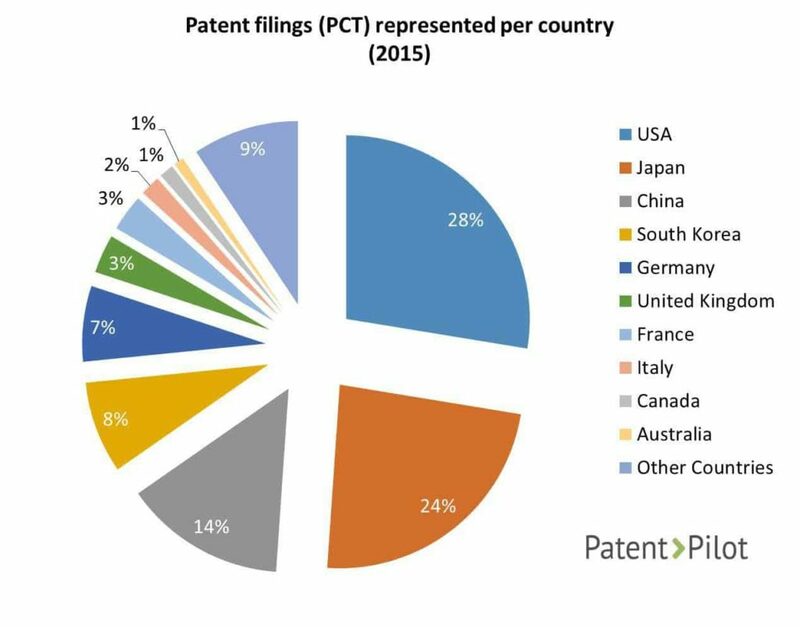 The majority of patents is represented in few patent active countries. The USA and Japan are still leading. China und South Korea, however, are on the rise. Over the entire period from 1978 to 2015, 88% of all PCT applications were handled by attorneys and law firms from only 10 countries. By far, with 34% the USA is at the top. Japanese attorneys/law firms serve 20% of all applications. Germany is with 9% in third place, but did not reach a double-digit percentage. Following are almost on par with very similar percentages between 4% and 5% the United Kingdom, China, South Korea, and France. With values of around 2% Italy, Sweden and Canada complete the top 10. The resulting picture is slightly different when taking only the figures of 2015. Australia ousted Sweden from the top 10, all other nations remain on the front seats. The ranks are changing partially but significantly. The US and Japan remain at the top with 28% and 24%, while Germany (7%) and the UK (4%) are being outperformed by China (14%) and South Korea (8%). Thus, emerging Asian countries overtake nations which are traditionally IP-strong. While Germany is still at a similar level as South Korea, Great Britain drops significantly and must defend its lead over France, which also comes in at 3%. Italy, Canada and Australia with 1-2% complete the explicitly stated states of the top 10. Attorneys/patent law firms who represented patent applications in 2015 could be found in 56 other nations. Overall, they are responsible for 9% of all patent publications, but no nation achieved more than 1% alone. Over the whole period between 1978 and 2015, the group of other nations adds up to 12%. So, concentration in the large countries has increased, which is mainly attributable to the rise of China and South Korea. This is also evident when one considers what proportion of all registrations of a country is attributable to the year 2015. 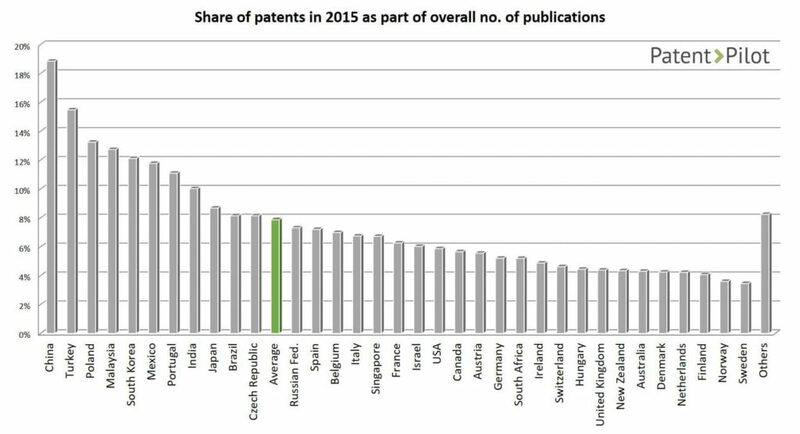 It is mainly emerging countries like China, Turkey, Malaysia and Poland, whose share of the past year in relation to their entire patenting history is above average. The industrialized nations can be found, as expected, to a large extent below the average of 7.9%, because they already show patenting activity for a long time. The list of largest countries is not surprising, neither are their ranks. There are nations with high IP activity worldwide. Above all, of course, is the USA, Japan and Germany. At the same time the rise of South Korea, and more recently by China could also be expected. But rankings based on absolute figures give only a part of the picture, which is why the numbers of patents represented are set in relation to, for example, the size of the population or the number of patent attorneys in the further course. The number of patents filed per one million inhabitants largely reflects the economic strength of a country. 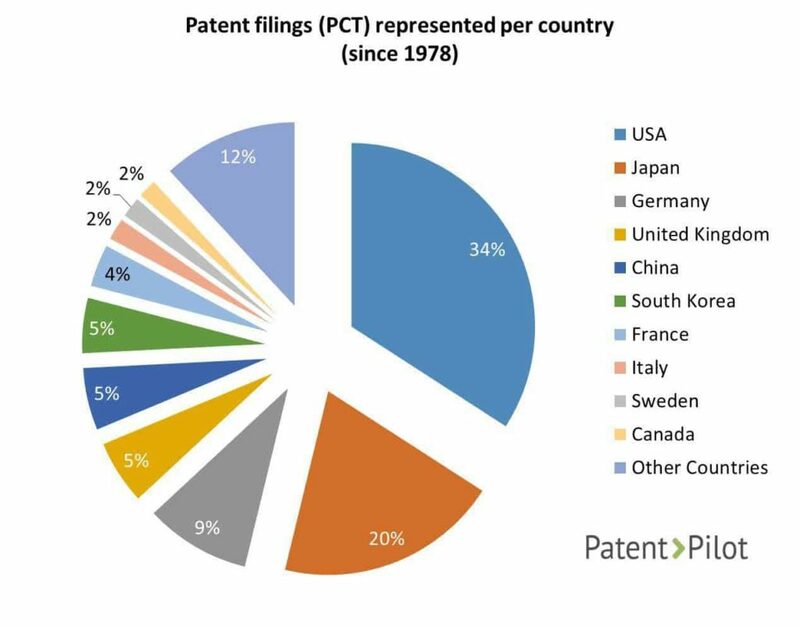 When putting the absolute figures of PCT patent applications represented per country in relation to the size of the country, a different picture emerges. From the top 10 in absolute terms, only 4 countries remain at the top of the list per one million inhabitants: Japan, South Korea, USA and Germany. Japan and South Korea are leading by far with 276 and 240 applications per million inhabitants. The USA and Germany are with 129 and 123 patents filed in the midfield of the top 10. Enclosed are Israel and two Scandinavian countries with Finland and Sweden. The Top 10 are supplemented by Switzerland (117), Singapore (98) and Denmark (97). It becomes clear: This ranking is dominated by highly developed Asian nations and NATO countries. The average of all countries is 28 patent applications processed per million inhabitants and year. The “Other Countries” constitute all nations who have not represented at least 100 patent applications that have been published in 2015. European nations are largely to be found above the average. Below average are mostly emerging and developing countries. In this respect, the overview mirrors to a large extent economic and innovative strength. It is similar to a per capita income statistic. Why are Japan and South Korea so far ahead? In those countries, large consumer electronics companies are headquartered. Patents play a major strategic role in electronical devices. A strong patenting position allows for asking licensing fees from direct competitors. In fact, it is almost impossible to sell a smart phone without infringing some market participants’ IP. Microsoft, for example, is making more revenue per android phone sold than they do from Windows Phones being sold because the own so many patents relevant for Android. At the same time, a strong patent portfolio keeps the external technology share in a company’s own products low when simply the number of patents is used in cross licensing agreements. Thus, patents help to maximize profit. Even large companies are bought in order to get access to the acquisition target’s patent portfolio. 6,815 patent law firms have been representing PCT patent applications in 2015. 72% of those are located in only 5 countries: USA, Japan, South Korea, Germany, and China. The distribution of patent attorneys across various countries should not be confused with the diagram of applications processed per country. However, as expected, there is a high positive correlation between the ranks in the two diagrams: In countries that serve a large part of the applications typically a large number of patent law firms can be found. Overall, 6,815 patent law firms have been active in 2015. They are taken into consideration if they have represented at least 5 PCT applications (in total, not 2015 only). The USA (1,976) and Japan (1,190) are the only two countries with a four-digit number of patent law firms. They are followed by South Korea, Germany and China where 500 to 600 firms were active in the year 2015. Overall, already 72% of all patent law firms worldwide have their headquarters in one of these 5 countries. Places 6 to 10 are each at 2% or 3% of all patent law firms worldwide. Compared to the list of patent applications represented per country, only the Russian Federation is new to the top 10. In exchange, Australia has to vacate his seat. In this overview, we counted each direct entry of a patent law firm in the patent documents. If a person (and not a law firm) is mentioned, this entry is only taken in consideration if no affiliated patent law firm could be identified in the address information. In this case, the analysis assumes that the person runs a single attorney firm, which in turn was counted as a patent law firm. On average, there are 1.6 patent law firms per one million inhabitants worldwide. The preceding overview of the distribution of patent law firms across countries shows which countries are important in the field of intellectual property. Unsurprisingly, this outline is dominated by large and economically powerful countries. It does, however, give little indication of how many patent professionals work in a country in relation to the size of the population. This list is dominated by four nations: South Korea, Switzerland, Israel and Japan. With values from 11.2 to 9.4 per million inhabitants, they show significantly higher numbers than all other nations. Those four countries are followed by a group composed of Germany, Singapore and USA with values from 6.8 to 6.2 patent law firms per million inhabitants. The Netherlands, New Zealand, Denmark, Finland and Slovenia are completing the list of the outstanding nations. They have 4.4 patent firms per million inhabitants each. The figures of all these countries are far above mean. In average, there are only 1.6 patent law firms per million inhabitants worldwide. It should be noted, however, that this value is greatly affected by the populous nations of China (0.4) and India (0.1), which form the bottom of the table. All the nations are included where at least one firm that belongs to the top 1000 firms in the world is located. Thereby, it can be avoided that countries distort the figures, in which internationally renowned patent attorneys are practically not existent. 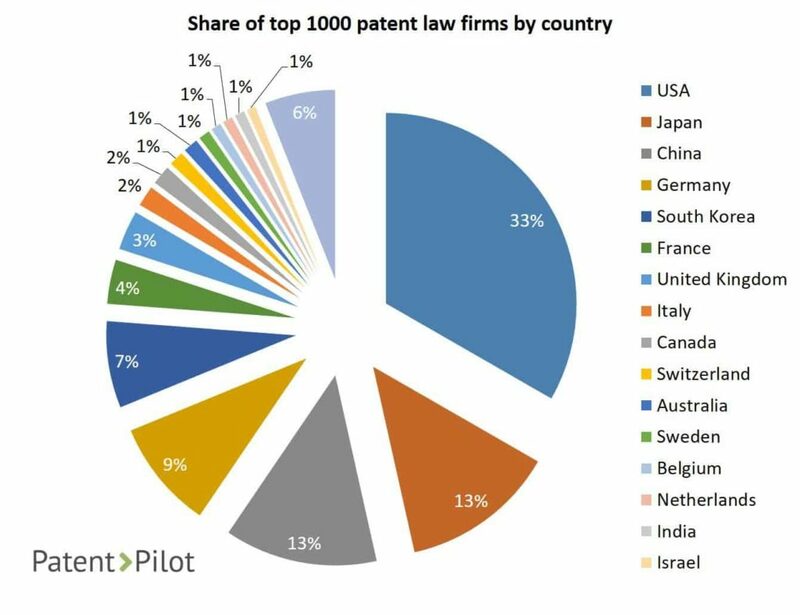 Besides China and Japan, it is mostly European countries leading the score in terms of patents per law firm. Chinese patent law firms have the highest rate of patent applications represented per year. In 2015, on average it has been 39.2 applications per firm. All other top places are occupied by countries that have a long tradition of patenting. A high number of patents per firm indicates a high level of concentration in the industry and an efficient support of patent applications. In this respect, China is probably an outlier, where growth in patents files is not yet reflected in the growth of patent law firms. Apart from China, only Japan on place 5 manages to break through the phalanx of European nations. France, Sweden and Finland are on position 2 to 4 followed by Belgium, the United Kingdom and Denmark on ranks 6 to 8. 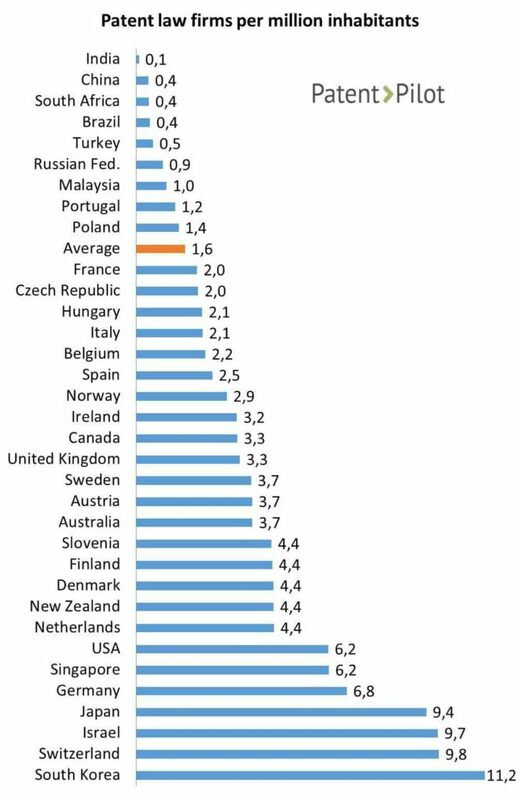 Those are the only nations that are above the average of 21.9 PCT applications filed per law firm. 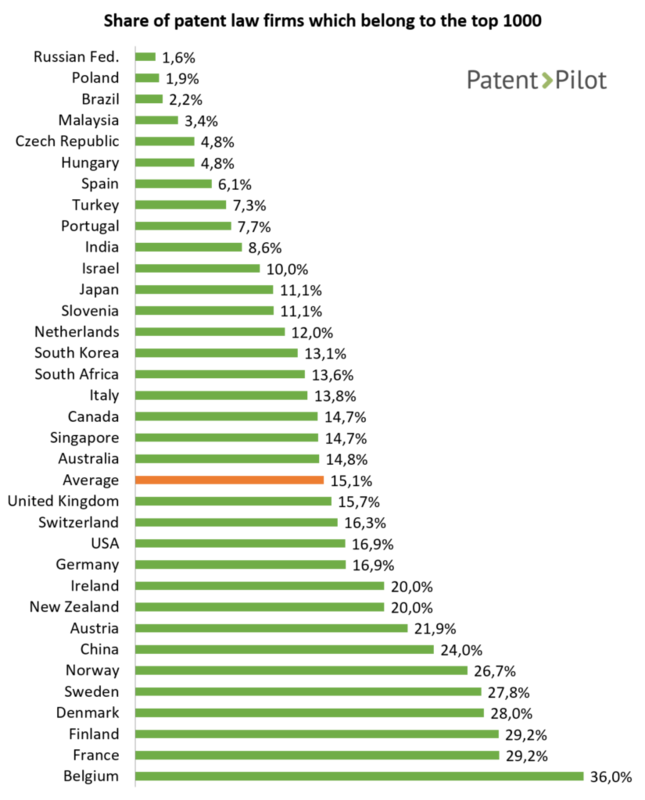 South Korea, USA and Germany, who are very active in patenting, are slightly below average. At the end of the ranking are the Russian Federation, Poland, Mexico and Brazil, with less than 5 PCT applications per firm. It is important to mention that only states were included in which at least 100 PCT files were published in the year 2015. The other not explicitly listed countries are on average below all listed countries with a arithmetic mean of 3.4 PCT applications represented per firm. 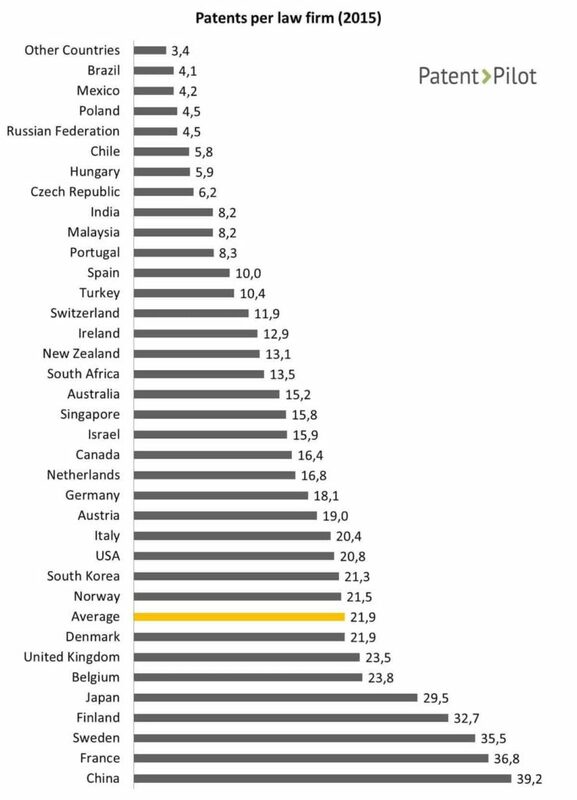 South Korea, Switzerland and Israel, which form the top the list of most firms per million inhabitants, can be found in the (rear) midfield of this ranking. Patent law firms, which are among the top 1000 in the world, are found mainly in the USA, Japan, China, Germany and South Korea. By top patent law firm, we mean patent firms, which have been the most active in representing clients in the PCT application process in 2015. Patent law firms, which are among the top 1000 in the world, are found mainly in the USA, Japan, China, Germany and South Korea. The USA leads the ranking by a considerable distance. 333 companies or 33% of all top law firms are headquartered here. The other countries of the top 5 hold shares between 13% and 7%. Together these are already 762 of the 1,000 patent firms. In all other nations, a maximum of 4% of the top law firms can be found and overall 24% of the top patent law firms. Conversely, this means that the five most important nations unite 76% of all top firms. The first ten places are complemented by 4 European countries (France, Great Britain, Italy, Switzerland) and Canada. They show shares between 1% and 4%, and 12% in total, which is less than China or Japan, which are ranked 2 and 3 and individually 13% each. The “other countries” consist of 17 nations, uniting 60 of the top 1000 law firms. This results in a 6% share. In 31 countries, where patent attorneys/law firms have represented PCT applications in 2015, no top patent law firms can be found. A different picture emerges when the population size is taken into account. The patent-active countries with a large number of inhabitants are no longer dominant. Of the countries with many top law firms, only China is still present in the top 10. The table is dominated by Scandinavian countries. Finland, Denmark, Sweden and Norway can be found in places 2 to 6. However, Belgium and France are at the forefront. In Belgium, 36% of the patent firms are among the top 1000 law firms in the world! On average, only 15% belong to the top law firms. Since the size describes the number of PCT applications represented, this is also a measure of the concentration and the market position of the large law firms in a country. Or the other way around: the lower the value, the less important are the large-scale patent firms in a given country.